Birthday reminders... a new view every month - a pleasant way of remembering birthdays! A nice way of recording your thoughts, sending a note or a greeting. 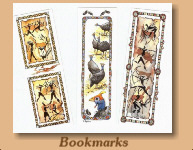 Use Isabel's bookmarks to track your place in an interesting book. They make nice little gifts too.